Studies have shown that seeing the color red increases the pulse and heart rate, one of the many reasons why red roses are associated with passionate love. 100 Red Roses Romance is in the air, and when you've found the perfect person to make your heart soar, making sure she knows your love is endless. Whether you're celebrating an anniversary or birthday, impressing her on Valentine's Day, winning her heart or simply sending a reminder that she means the world to you, nothing is more important than the one you love — and nothing can express romance better than radiant roses. When you're looking for a romantic, elegant arrangement to sweep that special someone off her feet, Ode à la Rose knows just the way to impress — a beautiful bouquet of 100 red roses. Make magic happen with a romantic delivery to her doorstep — our Amour arrangement made with all red roses is the ultimate expression of love. 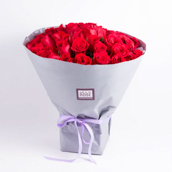 Available in 50, 75, or 100 roses, this grand bouquet is sure to take her breath away. Ravishing Red Beauty Rich like your love, velveteen in texture and radiant in arrangement, this breathtaking bouquet of 100 red roses offers affection and perfection in every bloom. Fresh from eco-friendly farms in Ecuador, our ravishing roses will reflect her beauty and have her heart. Abundant Aroma of Amour Subtle, soft and sweet in fragrance, roses are elegant, classy and modern. From the moment your loved one opens her chic gift box to find her beautiful bouquet, she'll experience the romantic radiance of 100 red roses. Send Your Love With Ode à la Rose Specializing in unique, elegant, modern flower arrangements handcrafted with the finest French techniques and freshest blooms from flower farms around the world, Ode à la ROSE believes in delivering beauty with every bloom. Send your love with 100 red roses today.